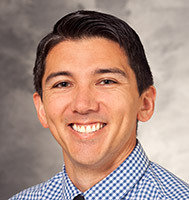 Dr. Dickson is a licensed clinical psychologist in the Department of Psychiatry. He completed his Ph.D. at Loyola University Chicago and pre-doctoral clinical internship in the Department of Psychiatry at the University of Wisconsin-Madison. Dr. Dickson has specialty training in cognitive-behavioral therapy for insomnia, evidence based interventions for circadian rhythm disorders and other sleep disorders, as well as cognitive-behavioral and acceptance-based interventions for depression and anxiety with adults.